Nature has always brought with it an enigmatic aura that is rejuvenating. Now, with our collection of Animal Arts wall décor you can bring nature’s beauty to your home/office décor. Whether you are searching for your favorite four-legged animal, gravity defying birds, or exotic aquatic creatures, we assure you that you will spot an Animal Art that is worthy of being a part of your home’s décor. The amazing range of hand painted artwork on canvas that comes with adorable traits like handcrafted frames. You also have the freedom to choose between a contrasting black & white artwork and a more vivid & colorful one. 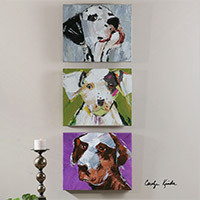 Available in two and three dimensional effects, the Animal Art collection perfect for animal lovers and folks who adore the uninhibited nature of artistic expressions. From galloping horses to loving mother & baby, collect and retail Animal Arts for Décor like no other online retailer! Animal Arts There are 24 products.